This southern California building renovation allows in lots of light, with slat shade systems and large overhangs for shade. This exterior courtyard for company events has been designed with a playful nod to the company's use of large concrete tubes in their industry. Planters, stools and seating nooks have been created using this surplus product the company has around anyway. Interior and exterior views of the space durning the day show a warm, comfortable feel with wood and stone. Lots of shade is offered as a reprieve from the harsh day sun. The large parking lot out front is covered in solar panels doubling as shade structures. The panels are easily enough to power all the night time lights for the parking as well as much of the power for the office building. These interior office views show various collaborative work areas. A small, tight knit team operates this company. The need to have many kinds of meeting areas with and without clients is addressed in this layout. The exterior facade of the building is clean and modern. Renovating this dilapidated building in the downtown area is an asset to the whole community. The existing structure. Poised and waiting for its renovation. The interior as it exists before renovation. The beautiful architectural details will be kept and accented. Details of the original building will be carried through into the renovation. Large doors bring lots of sun into the space. 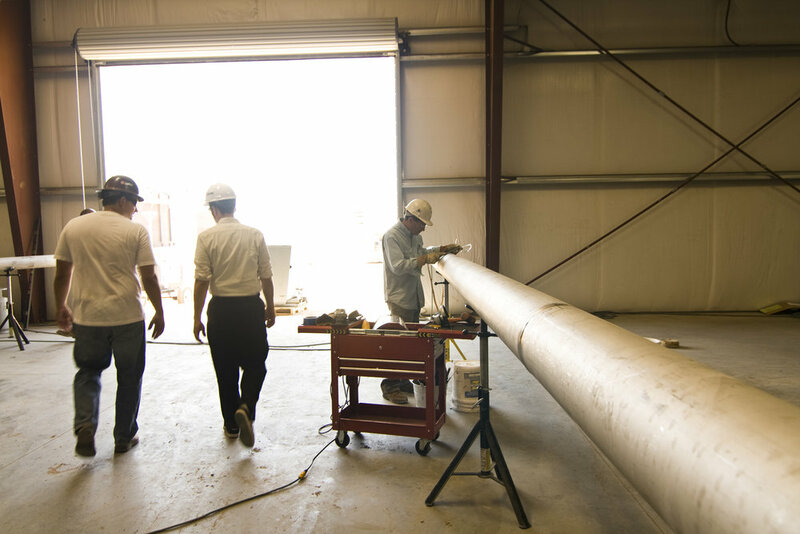 In this back part of the warehouse, workers fabricate specialty pipes. A detail shot of the facade shade system. Custom desks and a combination of concrete and carpet in this open floor plan. The original exposed ceiling keeps the warehouse look. Brought in to conceptualize ideas of how to renovate this bare bones warehouse building into a new company headquarters. We worked closely with the owners of the firm to realize the nuanced ideals of what this new home for their company could be. In the end we designed a place that could become their ideal new home.